I bought this bike this spring off of a friend as when he let me test ride it on my birthday last November, I fell in love with the power and handling as compared to my 2004 Kawasaki KLR 650. 2012 Aug 21 - I got my windscreen in the mail today from Aviciouscycle.ca and had it mounted and dialed in about an hour. It's a Slipstream Spitfire that came highly recommended on ADVRider and via a colleague who rode with his wife ATW on DR650's. He had this to say: "I have the Spitfire and my wife has the Cee Baileys, I like mine better though." hill climbs while off roading made it harder to read the ground ahead. He sent me two sets of stickers for free, well, almost free. I spent just under $800 over the past month with him, and was into the KLR for twice that amount over the past four years. Thanks Eric! It's the perfect bike for PEI. Unstoppable. Tomorrow I'll be packing up for a six day ride back to Ontario to hang out with the Turn 2 gang at Canadian Tire Motorsports Park for the Canadian Super Bike Championship doubleheader. My plan is to burn off the stock trailwings on the trip, then she'll never see smooth tires again unless I convert it to run Supermoto rims. Oh the possibilities!!! The KLR is better on the highway out of the box, but the DR has a shorter wheelbase, turns in quicker and is much more nimble in the dirt and on the road. The KLR has stock wind protection, the DR has none unless you count the front cowl which I don't. The KLR had to be over bored to a 685 to have any real oomph, whereas the DR puts a grin on your face bone stock. 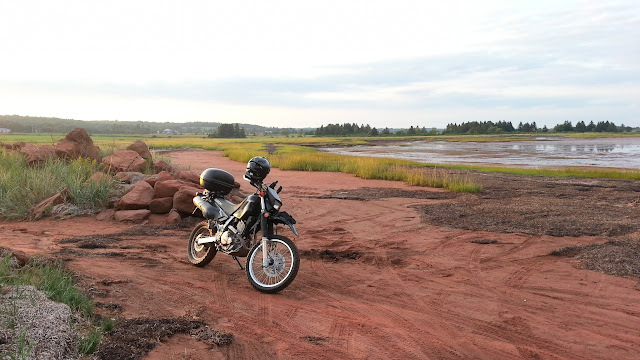 I may even mess with the sprockets as the top speed on PEI is 90kph, so I can use a slower second gear for offroad. Who wants to do 90kph at rev limiter? I'd rather be power wheeling through the rough stuff in second and whooping my head off. Two up riding on the KLR is easier, on the DR I find my boys crushed up against the tank too often. Oh, seat to peg ration is more comfy on the KLR, but I can transition to standing better on the DR without the bar risers I had to install on the KLR. I love my KLR and miss it when I hit the highway, but as soon as I hit any kind of loose surface, the DR wins hands down. The DR650 has better front brakes than the KLR, and although the front end dives like a submarine, the two piston front caliper does the job in a third less time than the KLR. The levers feel a bit weightier too, but with new ProTaper bars, all the controls and mirrors are more prone to spinning around the bars. One day I'll try KTM for comparison. Oh, my brother in laws BMW F800GS? Kills me on the highway, but his parts cost three times what mine do at the stealership, and he outweighs me by a hundred pounds. (and I can keep up to him). 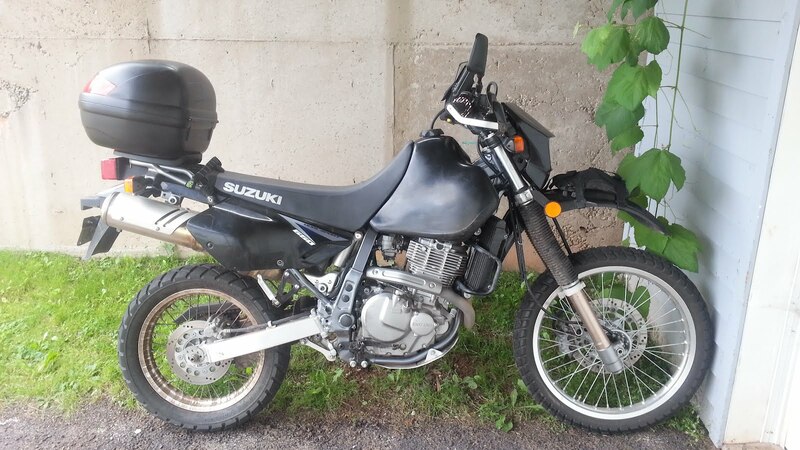 I found an advertisement on ADVRider Canadian Flea market for a used Suzuki Gel seat for $75 dollars before shipping, and Chris threw in a sheepskin for a round $100. It's sitting at my feet now, and I'll be upgrading that stocker before my next multiday ride. I can spend about four hours in the saddle before I need to move around. Five hours is okay, but sore. Looking forward to seeing you at Turn 2 carnage! 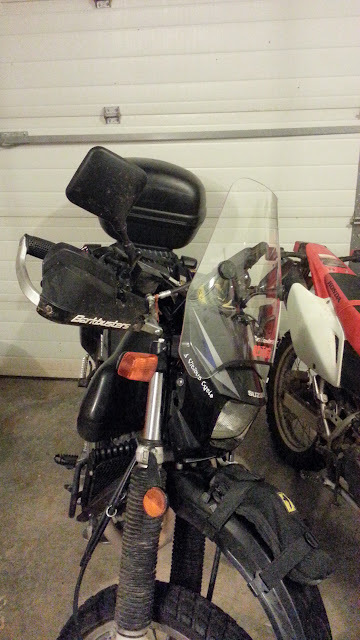 Also Paul Rogers said he put a custom seat on his DR650. You can talk to him for details.